By daylight, the city of Baku looks like the old city it once was with its historic stone architecture. However, once night falls, the city transforms into a glowing landmark. The skyline is filled with not only the yellow glow of city lights but also colorful skyscrapers that light up the night like a city of the future. 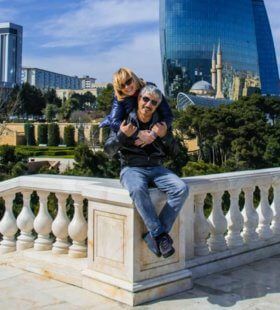 Most tourists come to Baku to see the famous historical, royal landmarks such as the Palace of the Shirvanshahs and the Maiden tower, but they also get to enjoy the modern architecture such as the colorful Flame Towers and the Heydar Aliyev Center. Stepping into this city will make you feel like you have both gone backward and forward in time. With all of the incredible architecture, you will want to have a professional vacation photographer to capture all of your memories.